Like Earth, planet Mars is a shooting gallery for rogue space rocks that zip around at tens of thousands of miles per hour. But the red planet has barely 1% of the atmosphere of Earth’s to slow down, vaporize, and break up any of these stray lumps of stone and metal. It also lacks the flowing surface water and robust weather of our home planet to quickly erase signs of the impact craters these strays leave behind. 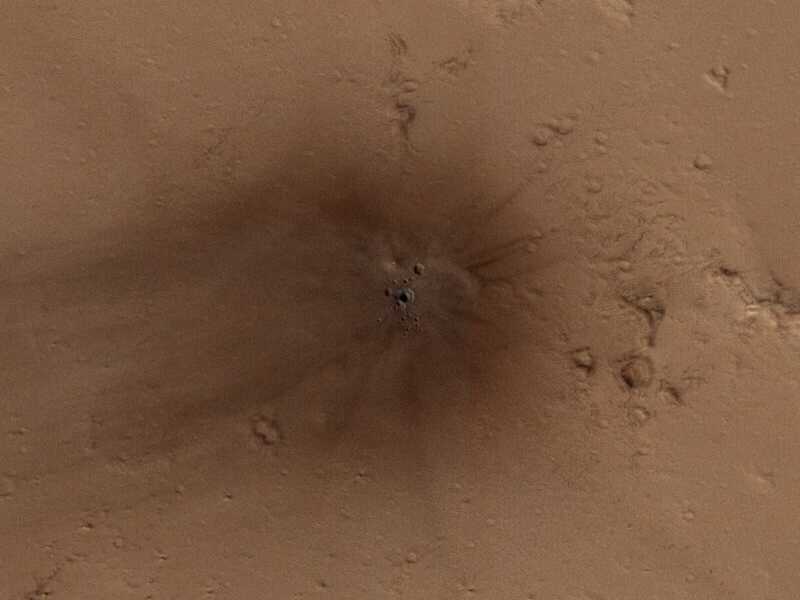 As a result, Mars is littered with celestial pockmarks and, occasionally, researchers spot fresh impact craters using orbiting satellites like the Mars Reconnaissance Orbiter and its HiRISE camera. Studying fresh impacts not only helps researchers peek at freshly exposed dirt on Mars, whichmay have once been habitable, but also helps assess how much risk Earth might face from small yet dangerous space rocks. The large and circular dark stain is roughly 650 feet (200 meters) from top to bottom, or about the length of a 60-story skyscraper lying on its side, and the central impact crater is roughly a few feet or meters across. It formed sometime between January 2014 and August 2016, so it’s pretty fresh. “[B]ecause Mars is so dusty (and there is wind there), all of that darker subsurface material was excavated and then billowed around the impact and downwind,” Ari Espinoza, a HiRISE media team member, told Business Insider in an email. The HiRISE camera is powerful enough to resolve objects just 31 inches (80 centimeters) across, so it’s worth zooming in to see the detail of the impact crater. “[W]e’ve catalogued several hundred over the past decade,” he said. Which shouldn’t make any of us comfortable, since even small near-Earth objects can burst in our atmosphere and wreak havoc on the ground.